Love can make you do crazy things as Ruby Parker discovers when she dies and returns from the grave to unearth how much Leo Culver loved her. With the aid of bad advice from a ghost who is trapped by a curse, a little bit of magic courtesy of her unsuspecting half-sister, and a televised music talent show coming to town to hold auditions, Ruby Parker makes more of a mess in death than she ever did in life. Can she fix everything before it’s too late? Or will she spend eternity as a ghost, haunted by the unknown depths of love? Either way, one thing Ruby learns is that while love can make you do crazy things, it can make you do amazing things too. But at what cost? And now for a guest post by DL! Thank you for having me on your blog today. 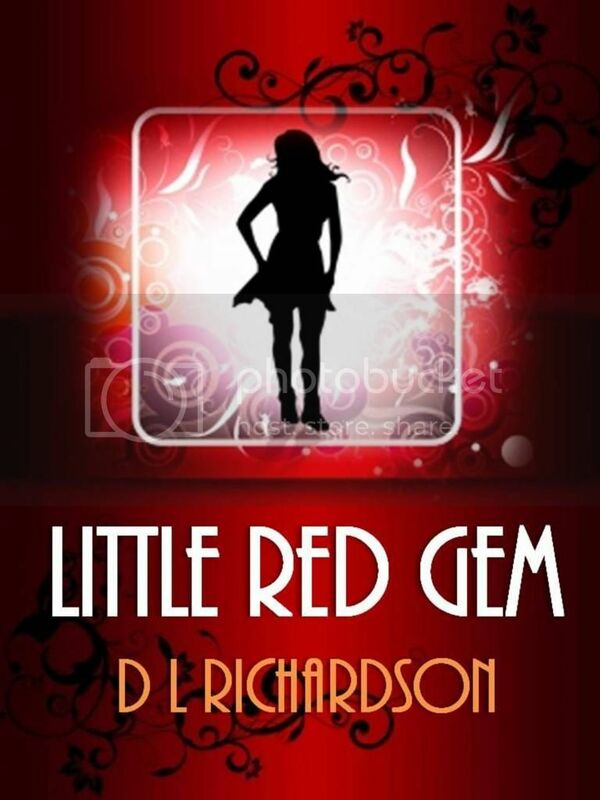 Little Red Gem is, at its core, a story about a girl who returns from the dead to find out how much her boyfriend loved her only to discover she only needs to love herself. To achieve this she uses magic, manipulation, and music. As today is Halloween I thought I would share a “magical” excerpt with everyone. This is the magic spell that the main character, Ruby, casts when she changes places with her half-sister, Audrey, so she can win Leo’s affections. This spell is taken from an actual book of magic but as to whether it works or not, I will let those seeking love find out for themselves. Teri left me alone to undress, and I was grateful for the privacy. The idea of standing naked and vulnerable in front of her sent goose bumps everywhere, plus maybe she’d notice something odd – like Audrey’s tiny fists pummeling madly against my chest to be let out – and my game would be up. I slid into the bath and couldn’t help but admit that the candlelight was charming and the aromatic perfume of rose petals was delicious. I was surprised when Teri knocked on the door. I’d fallen asleep. The missing hours rushed at me. I didn’t know about cleansed, but I felt super relaxed. Dressing in the light cotton pants and top Teri had folded over the chair for me, I only had to shake Audrey’s short hair like a dog and it was practically dry. I walked barefoot into the dining room to find Teri seated at the table fiddling with the items. I noticed she’d kicked the rug away to expose the wooden floorboards underneath. There was a ring of rose petals wide enough for a person to sit inside. Teri nodded – her eyes still closed – toward the kitchen window. Beneath the brimming anxiety that had squeezed at me since I’d died lay a bigger pool of anxiety, yet underneath her calming tutelage my insides became jelly-like and I relaxed. I understood now why Audrey wasn’t into magic. So much effort, and there was no guarantee this spell would work. Wide awake? After the delicious bath I’d had, it’d have been easier falling into a slumber the likes of which evil queens in fairy tales were fond of casting upon fair maidens. The heart that beat inside my chest wasn’t mine. I ignored the shame. “I could run a marathon,” I lied. The effort had drained every bit of juice I had at a time when I could least afford to lose it. Rose petals were not the easiest things to sort. They either got stuck to my fingers or they tore apart. Still, I peeled off seven petals and rubbed oil into the rest. I looked intently into the flame and was overcome by memories of the last night Leo and I were together. The log cabin had a fireplace. I hadn’t set foot inside the cabin to see it, but the scent of burning wood had tickled my nostrils from outside. I remembered the vibrant laughter of the boys coming from inside the cabin and the stab of jealousy that had coursed through me. Had I asked Teri to cast the wrong spell when what I really wanted was to reverse time? If I could have gone back to that night, I’d have handled things differently. I wouldn’t have acted jealous or angry. I’d have done the golden light breathing exercise and had a strong cup of honeyed tea to calm me down. I certainly wouldn’t have blown up at Leo for lying about drinking. And I wouldn’t have demanded that he prove the depths of his love to me. Don’t ask me how I managed, but I wrote the word ‘love’ on seven paper-thin petals and placed them in the bowl, half expecting something to happen, like smoldering smoke, flashes of lightning, fireworks, a frog turning into a prince, heck I’d have settled for a frog in the garden outside croaking. Absolutely nothing happened and I felt beyond cheated. I sighed loudly, as loud as water gushing out of a burst seal of a dam wall might sound. “Okay.” Reluctantly I repeated the chant, and I was genuinely surprised when an energy I could best describe as a warm glow traveled around inside my body. Teri coached me in repeating the spell and at the end of the seventh chant of “Together we shall know the beauty of a loving union. I ask this for the highest good of all”, she told me to say “thank you”. I did, and because she then told me blow out the candles I did that as well. After a brief further instruction from Teri, I closed the cord clockwise and took the water outside to pour into the earth of our little garden. “We’re done,” Teri said when I reappeared in the kitchen. “It had freaking well better,” I grumbled to myself on my way up to my room. Music first captured the creative interest of young adult author D L Richardson. From choir, to her first acoustic guitar at age ten, to singing with the school band and performed in main roles in two school musicals. When she left school she helped form her own rock band where she sang lead vocals, played bass guitar, and wrote all the lyrics. At age 26 she sold her equipment and focused on writing instead. She lives in Australia on the NSW South Coast with her husband and dog. When she's not writing or reading she can be found playing her piano or guitars, renovating the house, or walking the dog.